Heat coals or gas grill for direct heat. Brush steak sauce on both sides of beef. Cover and grill beef 4 to 5 inches from medium heat 7 to 12 minutes, turning once, until desired doneness. 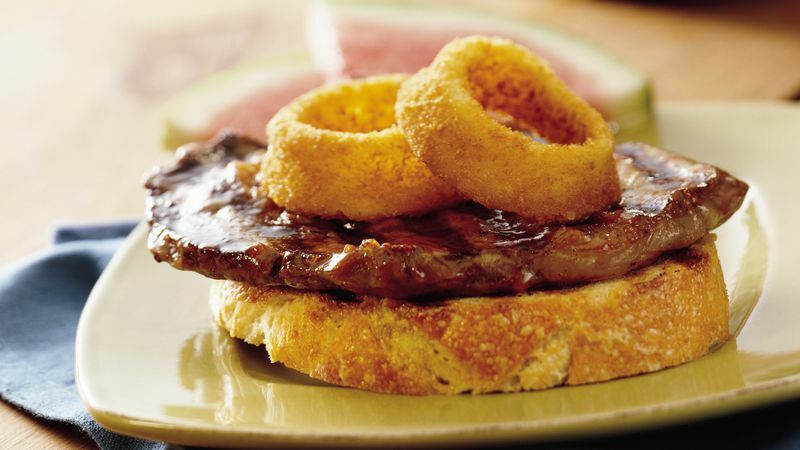 Serve beef on bread slices and top with onion rings. Serve with additional steak sauce if desired. Serve with grilled sliced onions instead of the onion rings. Cut 2 red onions into 1/4-inch slices and place on heavy-duty foil. Wrap foil around the onions, and pierce the foil with a fork. Grill 5 to 10 minutes or until tender. We don’t eat a lot of red meat in our house for health reasons, but when a special occasion comes around, I love to pick up a great steak and grill it up. Rib-eye is among our collective favorites since it has so much natural flavor and juiciness to it. When I make a rib-eye steak, I always season it simply with a good sprinkle of salt and pepper on both sides. Also, I make sure that my grill is really hot before putting the steak on so that it sears the flesh, sealing the flavor and juiciness in. Use a hardwood charcoal, like mesquite. There is a big difference between hardwood charcoal & briquettes. Briquettes are an amalgam of scraps bound together using all kinds of chemicals including formaldehyde! Start your charcoal at least 30 minutes before you plan on grilling. You really want to get to the stage where charcoal is evenly glowing & shrouded in white ash. Remove the meat from the refrigerator and let it warm up a bit (30 minutes to an hour) before grilling. It will cook quicker & more evenly! Put all the fire off to one side. Because of the fat content [of a rib-eye steak] they are extremely flammable -- it’s not a matter of if but when. Leave half the grill not hot. Mark them on the fire and pull them off as they start to catch on fire and develop a crust. Move them to the other side of the grill (without the flame) and close the top over them (leaving the vents open) like you are cooking them in an oven. That will cook the rib-eye all the way through without burning the meat. What’s your favorite cut of steak?